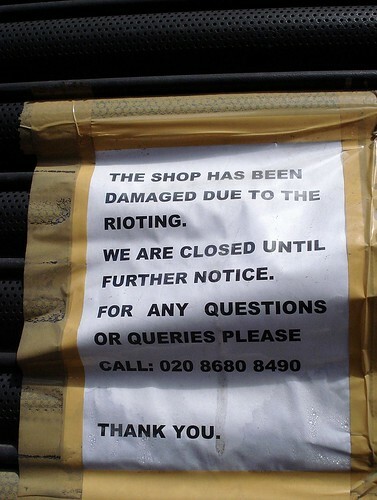 Sign on the Broad Green Eye Centre at 254 London Road stating that it's closed due to riot damage, May 2012. Photo: author’s own. Running north from West Croydon station to Thornton Heath, Norbury, Streatham, and beyond, London Road forms the heart (or perhaps the spine) of West Croydon; lined with shops, cafes, and restaurants, and threaded with buses. I live just off the southern end of it, having moved here at the end of July 2011, a couple of weeks before the evening of violence that damaged or destroyed so many of our local businesses. In the aftermath of the riots, I resolved to support the small business owners of London Road by shopping there whenever I could; what I didn't initially realise was how much this would improve my own day-to-day life. London Road doesn't just offer the possibility of buying yams and Turkish bread at 3am (an option I have yet to take advantage of); it lets me buy my food and household necessities from people who remember me, and say hello, and ask how I'm doing — all without the queues and corporate blandness of the chain supermarkets. 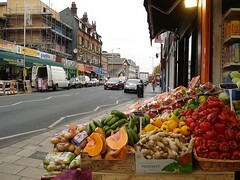 Looking north along London Road with a vegetable display from Cosco (64 London Road) in shot, November 2012. Photo: author's own. In January 2012 I organised a “Croydon Fun Weekend” and invited friends from London and elsewhere who hadn't yet experienced the joys of Croydon. We had an excellent weekend including dim sum at the Wing Yip centre, a wander around the Museum of Croydon, and pints of toffee apple cider at the Green Dragon. Perhaps the highlight of the weekend, though, was a day of Nigerian cooking at my house. Led by an experienced Nigerian cook, we shopped on London Road for tripe, cow skin, goat chops, bitter leaf, scotch bonnet chillies, ground egusi seed, pounded yam flour, pepper soup spices, and many other ingredients that I would have struggled to find in some areas of London — yet here they all were, five minutes' walk from home. It's not just food on offer here, though. In the stretch running north from West Croydon station alone, there's an independent pharmacy, a post office, a cobbler, a minicab office, a couple of pubs, a newsagent, and a guitar shop, plus several hairdressers, barbers, and beauty salons. Indeed, a fellow local resident tells me that the shops selling Black hair products are a significant draw to the area; she knows women from across the south east who make regular journeys to West Croydon for the sole purpose of shopping on London Road, since there are practically no Black hair shops south of the area. Looking south along London Road from the bus stop outside the Ship of Fools (9-11 London Road) with a number 289 bus in shot and North End in the background, June 2012. Photo: author's own. As well as retail, London Road has long been important transport-wise. The 1911 Ordnance Survey map shows a tramway running up London Road, with a branch off at Oakfield Road leading onwards up Whitehorse Road towards Selhurst. Today, buses run busily to and fro along the road, with a total of six routes offering destinations including Addiscombe, Brixton, Coulsdon, Elmers End, New Addington, Norbury, Purley, Selsdon, Shirley, Shrublands, Streatham, and Thornton Heath. West Croydon station also has its main entrance on London Road. 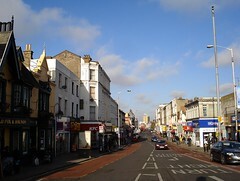 In addition, given the name of the road, it should not be a surprise that it forms part of the main route for car drivers travelling into Central London; numbered as the A235 at its southern end, further in it becomes the A23, retaining its name of “London Road” until just past Norbury, where it becomes Streatham High Road. Looking north along London Road from the pedestrian crossing just by the station, November 2012. Photo: author's own. Thanks to: all at the Croydon Local Studies Library; and my beta-readers bob and Helen. One of the traders, Bhupen Patel of Flair Afro Cosmetics, is quoted in a Croydon Advertiser article from April 2012 as having "regular customers from Brighton". I have a modern reprint of this map, specifically the Alan Godfrey printing. Needless to mention, London's only remaining street tram system now runs from West Croydon station in a network extending from Wimbledon to Elmers End, Beckenham Junction, and New Addington. The 60, 64, 109, 198, 250, and 289. There are also night buses running to/from Oxford Circus and Tottenham Court Road. 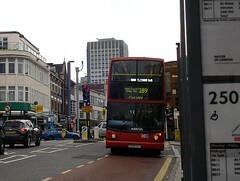 These are just the buses that run along London Road itself. West Croydon bus station, located on Station Road, offers many more destinations, including the early-morning X68 express — around an hour to Waterloo for an Oyster PAYG price of £1.35 at the time of writing (November 2012) — and by walking along to the end of Poplar Walk you can catch the X26 express that whisks you directly to Heathrow in around an hour and a half for the same price. Update, April 2017: As I’ve come across new sources of information, and realised just how much history it’s possible to dig out for each of these buildings, my initial “one article per week” goal has become something of a hindrance to my ability to do sufficient research. At the start of 2013 I switched to posting once every two weeks, at the start of 2014 I changed the schedule again to once every three weeks, at the start of 2015 I changed it yet again to once every four weeks, and during 2016 I decided that when I post an extra-long article I’ll delay the following one by a couple of weeks. I hope my readers agree with me that the additional level of detail this lets me supply makes up for the slower output of articles. I've also learned that there are quite a few gaps in the numbering of London Road, so with any luck I should still be able to get to the end of it before I die! At the time of this update, my scheduling spreadsheet has me publishing the final article on 3 February 2062, at which point I will be 86 years old. 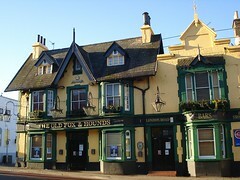 The Old Fox and Hounds stands on a corner site at the very southern end of London Road, just across the street from West Croydon station. With an exterior little changed from Victorian days, it’s yet another piece of history still visible in today’s Croydon.